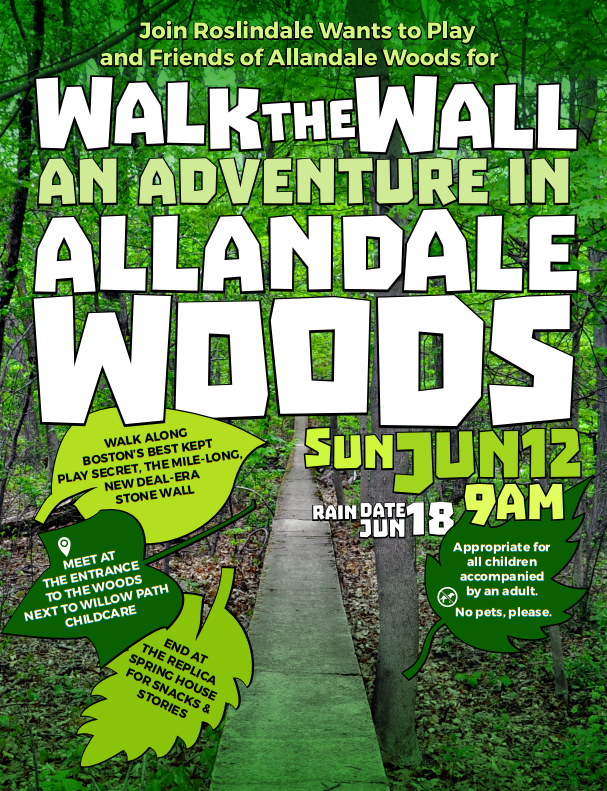 We are thrilled to announce that we are teaming up with Friends of Allandale Woods to host a Walk the Wall event at 9:00 AM on June 12. Among the many beautiful sights at Allandale Woods is a stone boundary wall built during the New Deal era. The wall remains in remarkably good shape and walking along it makes for a great adventure with your children. In fact, at Roslindale Wants to Play we consider the wall to be Boston’s best-kept play secret. We will meet at the entrance to the woods next to Willow Path Childcare at 9:00 AM on Sunday, June 12 to walk the wall, ending at the replica spring house for snacks and stories. This walk will be fun for children of all ages, accompanied by an adult. For an idea of what to expect in Allandale Woods, see our gallery below for photographs that we have taken on recent visits. We’ll see you on June 12 for a morning of fun!